The Mumbai half day city tour is one of the most popular tours. It covers most major attractions in South Mumbai such as Dabbawalas, Dhobi Ghat (open air laundry), Mani Bhavan (home of Mahatma Gandhi in Mumbai), Gateway of India and Hanging Gardens. This tour is strongly recommended for people who have just a few hours in hand and want to catch on the major highlights of Mumbai city. The narrow geographical layout, the coastline, the daily commuting, the various communities that make up the city, the old heritage district, the old commercial and residential districts. This tour is most suitable for those who want to cover the highlights of Mumbai in the shortest, sweetest way. Our licensed and experienced guides make all these places come alive with their extensive explanation. The recommended starting time is between 8 am and 2 pm on any day of the week. The most prominent landmark in the city built on the sea front in December, 1911 to memorialize the visit of King George V and Queen Mary to the city. The Gateway of India is located in Colaba area which is the most popular hangout for Indian as well as international tourists. The museum houses a huge collection of Indian artifacts and showcases the history of the country since the Mughal Times. The dabbawalas became famous worldwide when Prince Charles visited them and a documentary film was also shown on BBC. The dabbawalas are extremely professional as they distribute tiffin boxes in offices throughout the city with literally no margin of error. About 5,000 dabbawalas distribute 2,00,000 tiffin boxes everyday. Many business schools invite the dabbawalas for a presentation on their occupation as a part of their case studies. The new name for this station is Chhatrapati Shivaji Terminus. It is the headquarters of the central railway line in Mumbai. This is a heritage building with brilliant architecture. It is one of the most photographed buildings in India. This is the best place to get a bird’s eye view of Marine Drive which is also known as Queen’s Necklace. From Nariman Point at one end to Raj Bhavan at the other and the beautiful sunset in the horizon, this is one photo stop that you should not miss. The Rajabai Clock Tower is modelled on the Big Ben in London. The tower was built by a wealth businessman who dedicated it to his mother called Rajabai. Mani Bhavan served as Mahatma Gandhi’s home when he used to visit Mumbai. The two storied building is tucked in a quiet street in Girgaum, South Mumbai. The room on the 2nd floor where Gandhiji used to stay is kept as it is even today. The 2nd floor also has a doll museum depicting the important life stages in Gandhiji’s life. 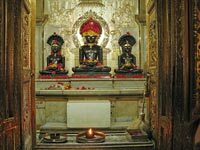 Some of the prominent temples in South Mumbai include Babulnath Temple (dedicated to Lord Shiva) , Hare Rama Hare Krishna Temple, Mahalakshmi Temple and Jain temple. These gardens are opposite each other in Malabar Hill Area of South Mumbai. The Hanging Gardens was built in 1880 atop a water storage reservoir. The garden is a haven for walkers and it has plant sculptures of various animals. Kamala Nehru Park offer a bird’s eye view of Chowpatty Beach and the Marine Drive Promenade. This is a huge laundry in the open located just next to the Mahalaskhmi station. The laundry has 1026 square cubicles where washer men wash the clothes, iron them and then place them on strings to dry. The clothes to be washed are collected from households as well as establishments such as hospitals and hotels. The land and cubicles are owned by the Government and the washer men have to pay monthly rent for the cubicles and water supply.